November 5, 2014 by Cope | Filed under New products. A new addition to our catalogue range is this Portable Vane type Anemometer. 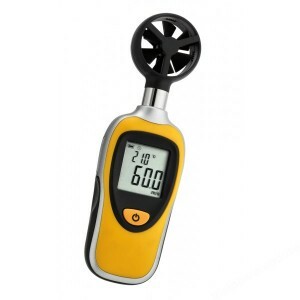 A compact hand-held vane-type anemometer which includes a thermometer and rugged ABS housing. The large clear backlit LCD readout enbales easy reading in all conditions. Other functions include maximum and minimum values and battery status readout. Overall 175 x 52 x 35mm L x W x D. Weight 115g. It comes supplied complete with battery. Full details of this product can be found at our webshop thelabwarehouse.com via the link below. Alternatively please contact our sales team for further information or for a quotation. AN450-25 Anemometer, vane, compact, hand held, wind speed range 0.4 to 30m/s, temperature range –30 to +60°C (alternatively –22 to +140°F).